Launch of DOTBOOK - India's first Braille laptop ! Workshop on "Use of Digital Content for Braille and Tactile Graphics Production in Braille Presses of India"
Every civilized society has to strive towards providing means for independent living with dignity to every member of the society. Apart from economic and social backwardness, differently abled in India and the rest of the developing world, face many more severe challenges related to mobility and education. This has a direct bearing on their economic independence as well as social integration. AssisTech is an inter-disciplinary group of faculty, research staff and students, which is engaged in using modern technology for finding affordable solutions for the visually impaired. The focus is on mobility and education which we consider are fundamental to enable any person to live independently and with dignity. Apart from working on specific solutions based on needs identified by the users themselves, we hope to create an eco-system that helps sensitize and ignite a number of young minds towards real day-to-day challenges of the differently abled. 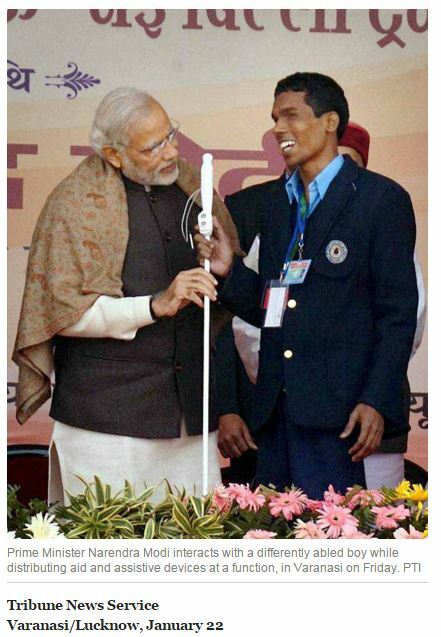 The ‘SmartCane' device is an affordable obstacle detection system that is mounted on the white cane carried by the visually challenged. OnBoard allows users to identify the route number of buses approaching a bus stop. TacRead is a device that enables people with visually impairment to read digital text through tactile interface. Tactile Graphics are produced using embossing or other technologies on physical medium like swell paper or PVC sheets. NVDA is a screen reading software that interprets information displayed on a screen, converting to audio via text-to-speech engines. Project RAVI focuses on making textbooks accessible to readers. Times of India, Economic Times, The Wall Street Journal, The Better India and more have featured AssisTech Group as a part of IIT Delhi showcasing our approach, effort and impact. ASSISTECH is an inter-disciplinary group of faculty, research staff and students, which is engaged in using modern technology for finding affordable solutions for the visually impaired. The focus is on mobility and education which we consider are fundamental to enable any person to live independently and with dignity. Apart from working on specific solutions based on needs identified by the users themselves, we hope to create an eco-system that helps sensitize and ignite a number of young minds towards real day-to-day challenges of the differently abled. Ideation, research and development of affordable assistive devices and technologies for independent mobility, education and independent living of visually impaired through a confluence of embedded system, mechanical and industrial design. Bridging the gap between lab prototypes and products with end users through collaborative translational research and field testing with industry partners and user organizations. Direct involvement of user groups for ideation, prototyping and testing. A holistic user centric design and co-creation model encompassing technical, societal and usability aspects of devices. Public sensitization towards the accessibility needs of persons with special needs. Raising awareness about assistive technology solutions in the user community. Aiding training and dissemination efforts to reach needy persons.